The number of wide receivers who have recorded 200-plus point fantasy seasons has waned in recent years. In 2014, six receivers were able to eclipse that threshold. Since then, that number has been reduced to five in 2015, three in 2016, and just two in 2017. Despite this recent trend, there are plenty of wide receivers who could put up those kinds of numbers if things break their way. Here are my Top 10 wide receivers for 2018 Fantasy Football. Antonio Brown is still the benchmark for fantasy production at wide receiver. His numbers over the last five seasons put him in a class by himself among today’s Top 10 wide receivers. During that span, Brown has amassed 7,848 receiving yards and caught 52 touchdown passes. Entering his age-30 season, Brown has yet to show signs of a decline. Last season, he had eight 100-yard receiving efforts in just 14 games played. He looked as good as ever in Pittsburgh’s season-ending loss, beating Jaguars’ cornerback A.J. Bouye for two touchdown catches. Bouye had not allowed a single touchdown catch during the regular season. Brown’s chemistry with quarterback Ben Roethlisberger is unrivaled in today’s game. The threat of running back Le’Veon Bell forces defenses to be honest, opening up holes for Brown down the field. There are cases to be made for a couple of other receivers to claim the top spot, but Antonio Brown is the safest bet to end 2018 as fantasy’s overall WR1. DeAndre Hopkins disappointed many fantasy owners in 2016. Hopkins finished that year as a low-end WR3 despite playing all 16 games. Knowing what we know now, it’s safe to say Hopkins’ down year was the result of being saddled with Brock Osweiler at quarterback. Hopkins bounced back in a big way in 2017, finishing as fantasy football’s top receiver. Hopkins started the year hot with rookie phenom Deshaun Watson at the helm. When Watson tore his ACL in Week 8, owners feared Hopkins’ numbers would spiral towards 2016 levels. But that was not the case, as Hopkins remained productive regardless of who was the Texans’ quarterback. Hopkins scored at least 7.3 fantasy points in every single game he played last year and never finished outside of the Top 40 among fantasy wideouts in any single week. That consistency combined with his massive upside has owners salivating about what he and Watson can do over the course of a full season together. Unlike last year, however, there will be no discount in acquiring Hopkins’ services. He is currently going off the board in Round 1 and should be the second receiver chosen in most drafts. That is exactly where I have him slotted in my Top 10 wide receivers for 2018. OK, so technically his PPG went up last year from 2016. Still, this chart is a bit of a red flag for those looking to avoid Beckham in redraft leagues. However, I tend to believe that talent wins out, and Beckham is among the most talented receivers in football. His ability after the catch separates him from nearly every other receiver in football. Beckham had over 500 yards after catch (YAC) in each of his first three seasons. Beckham’s knack for making plays after the catch masks the fact that quarterback Eli Manning is exhibiting signs of decline as he enters his 15th year in the league. I also feel that having dynamic rookie running back Saquon Barkley will be a boon for Beckham in the same way having Le’Veon Bell benefits Antonio Brown. With Barkley in the fold, defenses will not be able to shadow or double-team Beckham as easily as they have been of late. Ultimately, I believe Beckham’s upside is too great to ignore. I have him as my overall WR3 this year. Fantasy players love to hate on Julio Jones. The most common complaints are that he gets hurt too often (easily debunked) or that he doesn’t score enough in weekly DFS games. Either way, I submit that it’s not Jones who is the problem – it’s us. Our expectations for Jones have always been incredibly difficult for him to live up to. Perhaps it’s the draft stock Atlanta gave up to acquire Jones prior to the 2011 NFL Draft. Maybe it’s the freakish combination of size and speed that Jones possesses. *Allen averaged 90.6 yards per game in 2015 but only played in eight games that year. **Green averaged 96.4 yards per game in 2016 but only played in ten games that year. Simply put, Jones is a beast and is a threat to dominate every single week. He is a top-five wide receiver who is a couple additional touchdown catches away from vying for the number one spot among the top 10 wide receivers for fantasy. Keenan Allen suffered a torn ACL in Week 1 of the 2016 season and was lost for the rest of that year. He returned last year and finished as the overall WR3 in fantasy. Allen seemingly got better as the year wore on. Over his last seven games, he posted an incredible 116 fantasy points, finishing in the Top four in four of those seven weeks. Allen is the focal point of a potent Chargers’ passing attack that has averaged over 4,500 yards per season since 2013. To say Allen is quarterback Philip Rivers’ go-to receiver would be a massive understatement. The AP Comeback Player of the Year posted a target share of 27.3 in 2017 and had more targets and receiving yards than any two Chargers’ pass catchers combined. Allen’s target share could conceivably increase this season following the loss of tight end Hunter Henry to a torn ACL of his own. Allen has a nice combination of weekly floor and ceiling that make him an ideal target early in the second round of fantasy drafts. Injury is the only thing that could take him outside of the Top 10 wide receivers for 2018. Michael Thomas finished as last season’s overall WR8 on the strength of 1,245 receiving yards and five touchdowns. Those numbers are particularly impressive when you notice that Drew Brees threw the ball considerably less in 2017 than he had in any other season during this decade. Before last year, Brees had averaged at least 40 attempts per game in every season since 2010. Last year, Brees attempted just 33.5 throws per game. If you believe (and I do) that Brees approaches and perhaps exceeds 600 pass attempts in 2018, Thomas will stand to benefit the most. I expect the Saints to throw the ball much more often, particularly early on while dealing with the four-game suspension of running back Mark Ingram. A 10 percent increase in production would have netted Thomas a top-four fantasy finish a season ago, and I believe that upside is in play if New Orleans reverts to more of a high-volume passing attack. I think Thomas is a rock-solid WR1 in fantasy this year. When it comes to predicting future fantasy performance, I generally subscribe to the theory that year-to-year yardage totals are more sustainable than touchdowns. Based on that, it feels a bit weird to expect a wide receiver who has never finished in the top-20 in receiving yards in a single season to finish the year as a WR1. Then again, Davante Adams has already turned the trick in back-to-back years, so why not expect him to do it again? Adams leads all players with 22 touchdown catches over the last two years. And while that generally is not a number I like to rely on, it’s well within reason to expect another double-digit touchdown output in 2018. First and foremost, Aaron Rodgers is back. Since 2011, Rodgers has played in 95 games and has thrown a whopping 226 touchdown passes. There will be plenty of opportunities for Adams to display his uncanny knack for the end zone. Even if Adams sees a slight decrease in touchdown catches, any lack of fantasy scoring on that end should be mitigated by an uptick in volume following the release of longtime Packer Jordy Nelson. Nelson has long been a favorite of Rodgers, totaling 303 targets over the course of two full seasons in 2014 and 2016. Adams will likely take Nelson’s spot as Rodgers’ preferred outside target while newly-acquired tight end Jimmy Graham and veteran slot receiver Randall Cobb wreak havoc over the middle. I think Adams is a lock to set career-highs in receptions and yardage this season and makes for an excellent second-round fantasy pick and a comfortable slot among my top 10 wide receivers. A.J. Green continues to be a consistent fantasy force year in and year out. Green has finished among the top 10 wide receivers in four of the last six seasons. One of those seasons in which he failed to reach that level was 2016. That year, he was leading all receivers before suffering a torn hamstring in Week 10. Green bounced back to finish 10th last season despite a career-low 67.4 receiving yards per game. He will once again figure to be force-fed targets by Andy Dalton in 2018. Green’s 145 targets were eighth in the NFL last season, and he should be among the leaders in that category once again. Cincinnati did little in the offseason to augment an already suspect group behind Green. Brandon LaFell will be 32 years old in November and has never had a 1,000-yard season. The rest of the group remain unproven and inconsistent. Green could see a target share approaching 30 percent in 2018. Regardless of what we think of Andy Dalton, that volume ensures Green’s status as a WR1 in 2018. 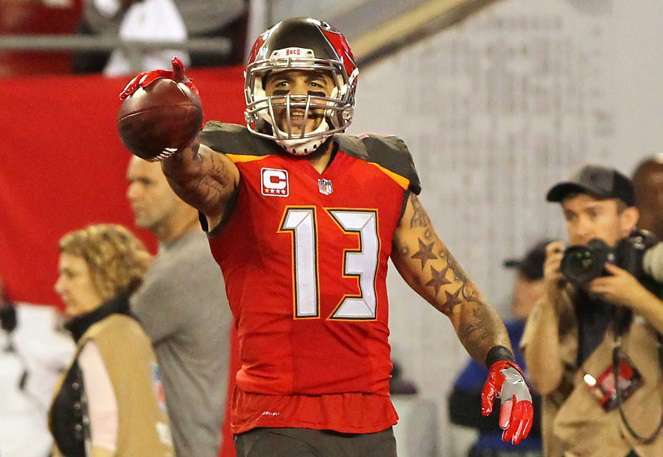 I really want to put Mike Evans higher up in the top 10 wide receivers, but I just can’t bring myself to do so. Evans has played four seasons in the NFL and has had at least 1,000 receiving yards in each one. While Evans has put up consistent yearly yardage totals in his career, his fluctuating touchdown numbers have resulted in yearly fantasy finishes that are a bit too up and down for my liking. Evans finished as the overall WR11 in his rookie season and followed that up with a somewhat disappointing WR27 finish in 2015. He broke out in 2016 and led all fantasy wideouts in scoring before ending last season ranking 18th among wide receivers in fantasy points. In addition to his lack of year-to-year consistency, his 2017 weekly numbers were underwhelming as well. Evans failed to post a top-four weekly finish in any week last year and did not finish as a weekly WR1 in any of his last nine games. It is this inconsistency that prevents Evans from being a first-round fantasy pick in my estimation. 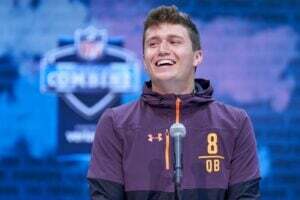 The upside is there if he and quarterback Jameis Winston can put it all together as they did in 2016, but Evans carries a fair amount of risk given the other options available in Round 2. Last month, I participated in an industry mock draft and had the choice between Doug Baldwin and Tyreek Hill at the beginning of the third round. I chose Hill, but I feel like if I had to make that decision 100 times, I’d probably pick Hill 50 times and Baldwin 50 times. I chose Baldwin here over Hill because I wanted to show him some love, as he’s currently being selected seven spots behind Hill in Fantrax drafts. I think Baldwin makes for an excellent value pick this season. Baldwin has paced the Seattle Seahawks in targets and receiving yards in four consecutive seasons, and figures to do so again in 2018. In fact, Baldwin should see an even greater share of targets in what has become an increasingly higher volume passing game in Seattle. Tight end Jimmy Graham and wide receiver Paul Richardson left Seattle in free agency, leaving behind 178 targets. The duo also caught 16 touchdown passes last season. Seattle added Brandon Marshall and Jaron Brown, but they will not be expected to replace that production. I envision much more work for Baldwin, and to a lesser extent, Tyler Lockett. Baldwin finished among the top 10 wide receivers in both 2015 and 2016, and I expect a return to that form this season. It’s time to ramp up your Fantasy Football prep. This article was a start. Another good step would be catching the next episode of Full 60 Fantasy Football, where Joe Pisapia, Scott Bogman and The Welsh break down everything you need to make 2018 a championship season for your Fantasy Football squads.